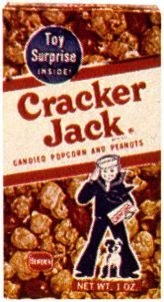 Some of us older timers remember Cracker Jack, a snack mixture made of caramel-covered popcorn and peanuts with origins at the end of the 19th century. Of course, the most distinctive element of the product wasn’t the edible part but the “toy surprise” buried in every box. Although, thinking back, the biggest surprise was probably why any of us cared about those trinkets in the first place. Anyway, the edtech professional development community has its own variation on Cracker Jack: the event known variously as a “demo slam”, an “app smackdown”, or some similar title. In these sessions, popular at EdCamps and smaller conferences, participants line up to present a two or three minute demonstration of a favorite piece of software or web service. Sometimes they try to connect the app to teaching and/or learning. But in that brief space of time, the focus is most often on the “wow factor” of the tool. At larger conferences lacking a formal “smackdown” contest, the program is often littered with sessions completely devoted to this concept. With titles like “60 Apps in 60 Seconds” or “29 New Web Sites You Need to Check Out”, and “Tech Share Live!”. Like Cracker Jack, these collections are a sweet mixture of cool tech stuff. With virtually no nutrition. And, if you’re lucky, a trivial prize buried inside. Ok, I know there’s nothing wrong with indulging in a sweet treat every so often. I’ve had my share of Cracker Jack (although I much prefer Screaming Yellow Zonkers in that crap food category) and other items of questionable nutritional value. And there’s nothing wrong with most of those demo slam, “cool tools” sessions. Occasionally it’s fun to have people rapid fire demonstrate a whole bunch of apps and maybe discover something new. I’ve even been known to participate in a smackdown or two. However, the problem comes when we overindulge in snack food. Or in a constant search for the new, the next alternative, the techno “cool”. Looking for the toy surprise buried somewhere in the app store. A few good things to read, hear, and watch when time allows this week. I'm writing this from somewhere over the Atlantic as we return from a week or so on the Amalfi Coast of Italy.1 Mostly pleasure for me, partially work for the musical wife. More about that later, after I've recovered from the jet lag and eight hectic days, along with a few pictures. Or maybe a whole lot of pictures, depending on what's on the memory cards. But one fact of traveling with a group as we've been doing, is that it often takes a little longer to get forty people heading in the right direction, not to mention arriving at a destination3. But the process does allow for time to catch up on both reading (thanks in large part to Instapaper) and thinking. So consider this a toe in the water as I prepare dive head first into the stream that is my normal life. Fair warning however. I may not be totally coherent tomorrow, at work or anywhere else. 1 It will be posed after we get home since United doesn't offer wifi, free or otherwise. 3 Especially considering the narrow twisty roads we've been traveling on in a 48 passenger bus. Yesterday I tweeted a little piece of news fluff about 10 Congress critters voting against a resolution proclaiming March 14 as Pi Day, speculating (humorously, I hoped) that they might have no clue as to what pi is. I was surprised to receive several very serious @replies, and one DM, with various versions of the sentiment that Congress had better things to do with it’s time. I’ve heard similar statements made by talking heads on television. I disagree with them all. We certainly have a lot of economic problems in this country, ones that need the serious attention of our leaders, many of whom have decreed the situation to be a “crisis”. However, this not the kind of 24 crisis which demands that everyone maintain single, focused attention on the situation so that two or three absolutely life-threatening critical decisions can be made correctly before getting to the :28 station break. As long as the President and Congress don’t spend long hours debating the minutia of the propositions, there’s no reason why they shouldn’t continue to issue these proclamations calling attention to a particular part of American society, in this case math education. Or do any of the other mostly meaningless little pieces of ceremonial trivia that make up the pomp and circumstance of our federal government. We will survive this economic mess as well as the theatrics surrounding the annual pardoning of the Thanksgiving turkey. Today is the 25th anniversary of the Macintosh, the day the first model in the line was released into the world. As near as I can figure, we’ve had 15 different Macs around the house over the years, including a couple of Power Book models I used but which belonged to the school district. For the sake of trivial completeness, here’s the complete list (* = machines we still have around the house).